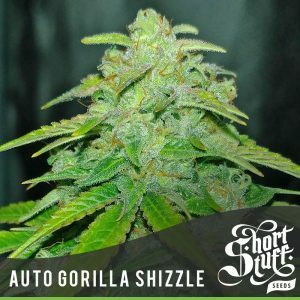 Free Shortstuff seeds – 2 x Auto Gorilla Shizzle with every pack! and so on….. with no limits! Tha Shiznit has been one of our bestselling strains for the last couple of years thanks to the fact that it has THC levels of over 20% and that in 1 test grow a single plant produce 520 grams of dried buds. When looking for strains to cross with our “all conquering” Auto Gorilla OG strain we knew that Tha Shiznit had to be on the list and initial testing shows we are not going to be disappointed. This new cross is just as bushy, just as vigourous and smells just as tasty as its parents and it looks like the yields are going to be right up there as well! Auto Gorilla Shizzle is a very easy to grow plant that will reward you with fantastic yields if she is well looked after and given enough light and space to grow. You will notice that this strain grows incredibly vigorously right from the first week and will easily reach 4 feet (1.2m) in height with a similar width. This girl gets big! She produces some huge buds which may need to be supported towards the end of flowering. The buds glisten with THC crystals and are highly resinous with a delicious citrus aroma that makes the growroom smell of oranges and lemons. In a simple soil set-up, 2-3 ounces (60-90g) is easily achievable and if you have a full-on hydro setup 10 ounces (280g) per plant is within reach. All of this will be done in around 10 weeks from start to finish so even the harshest auto-critics had better pay attention! Like Tha Shiznit, Auto Gorilla Shizzle is incredibly potent but thanks to some sativa genetics in her ancestry you do not get a “knock-out stoned effect” but more of a cerebral high that allows you to function. The smoke is smooth with a flavour that is earthy and citric and the effect will last for several hours. Due to the massive trichome production of Auto Gorilla Shizzle she is the perfect strain for making hash, Rosin or extracts from so nothing is wasted.